The PhD program offered in the School of Science enables students to complete extensive, independent research (100,000 words). In pursuit of excellence, Monash scientists set new standards that influence technological developments, contribute to improvements in health and social well-being, support environmental sustainability, and result in advances in industrial practices. Postgraduate science students have access to internationally renowned research centres and can develop close professional relationships with local industry and government. The Monash PhD has an international reputation for excellence and relevance, with quality supervision at the heart of our success. The Monash University Handbook has detailed information about the structure and requirements for the PhD program in the School of Science. To apply for the PhD program in the School of Science, you must have completed a degree with honours 1 (first-class) or 2A (upper second class) in a relevant research area. Our PhD can be undertaken over four years of full-time or eight years of part-time study. You can apply for the PhD at Monash Malaysia throughout the year, subject to availability of supervision. 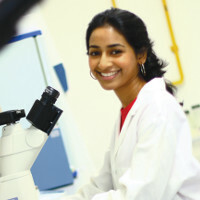 PhD student Tanuja Rajah used humour and notions of love and death so well to explain cell division and multiplication at the 2011 Monash Three Minute Thesis competition that she won, becoming Monash Malaysia’s first winner of the annual event. Tanuja says she learned to explain complex ideas while working with her peers in groups, swapping ideas and information.